Browse our range of cellular office workwall solutions which can be made to measure for any office space. 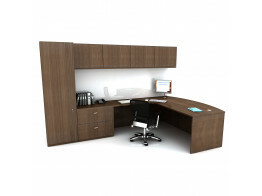 This versatile office piece of furniture allows you to work in comfort, while having access to all your personal files and belonging in easy to reach storage. Workwalls are bespoke cellular management office furniture where storage and desk are combined in a design to fit a side of your office. Workwalls can be made unique to your specification and finish. 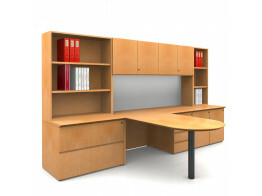 Office Workwall: a complete office environment that makes maximum use of the floor space. Mobile pedestals can be incorporated for added flexibility. All desks can feature cable management solutions to allow IT equipment to be safely and discreetly connected. With 16 beautiful veneers to choose from, a workwall can be matched to any existing furniture or be used to create a striking contrast.